Under the old law as it is recognized in many passages of the Talmud (e.g., Ket. 81b) and implied in the Mishnah (Ket. ix. 2; B. Ḳ. x. 1), the goods and chattels of a decedent, or the moneys due to his estate, can not be seized by his creditors or by his widow, who is a bond creditor for her jointure ("ketubah"), though R. Meïr distinctly said, and the Mishnah in one place intimates, that all of a man's estate is bound by the latter instrument. The very name given to lands and slaves, "estate which has responsibility" ("aḥarayot"), as shown in the article on Alienation, indicates that land was deemed by the old sages the primary fund for securing creditors (see also Deed). It may hence be inferred that in Palestine, even after the destruction of the Temple, and in Babylonia, the Jews were, down to the completion of the Talmud, in the main land-owning farmers, not landless traders or artisans. In later times, when the bulk of the Jews had become landless, this rule became impracticable, andthe Geonim instituted another rule, subjecting the goods and demands of decedents, as well as their lands, to their debts (see Shulḥan 'Aruk, Ḥoshen Mishpaṭ, 107, 1). Maimonides shows that even without this new institution the orphan heirs of A, who have as such obtained the land of his debtor, must give them up to A's creditors; for the lands would be considered as coming to them from their father (Ket. 92a); and morally orphans were always bound to pay their father's debts to the extent of both lands and chattels received ("Yad," Malweh, viii. 9, based on Ket. 91b). As to priorities of bond creditors on descended lands, see Deed. Regarding personal property, all creditors are on an equality, except in so far as one gains a priority by making the first seizure. The codes say little or nothing about the distribution of an estate that is not sufficient to satisfy all creditors. Bond creditors take lands sold by the heirs out of the hands of the purchasers (unless the heirs will pay the debt), in like manner as they prevail against purchasers from the debtor himself. The manner of appraising the lands of infant heirs, and of advertising and selling the same for the payment of debts, is described in the article on Appraisement (see also Ḥoshen Mishpaṭ, 109). A sort of judicial conveyance, known as "adrakta," is drawn up after the selling of the lands, which must contain the declaration that the lands sold belong to the deceased debtor, naming him (ib.). A debt arising by word of mouth, or by written contract not sealed (see Deed), can be set up against the debtor's heirs in three cases only: (1) if the debtor had in his last sickness acknowledged the debt; (2) if the debt was not due at the debtor's death; (3) if the debtor had been excommunicated for failing to satisfy a judgment, and had died while under the ban; for in other cases the debt might have been paid in the debtor's lifetime without the knowledge of the heirs. 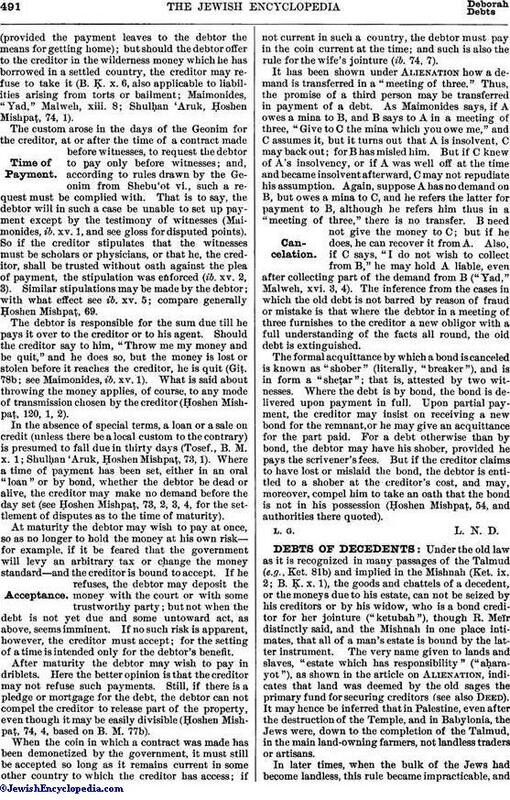 And, except in these three cases, even a debt by bond can not be enforced against the heirs during their infancy (boys under thirteen), though the bond contain a clause that the debtor trusts the honesty of the creditor; for these heirs, if of full age, might find proof to overcome the bond or to show its having been paid. Nor can the debt be enforced during the infancy of the heirs if the testimony of witnesses is needed to bring it within one of these three cases; for witnesses can not be adduced against an infant. Hence it was usual to make a judicial minute of the debtor's death-bed acknowledgment. So decides Caro (Ḥoshen Mishpaṭ); but Maimonides (Malweh, xii. 1, 2) holds that during the infancy of the heirs no proceedings can be taken in any cases but the following two: (1) where the demand belongs to a Gentile, and bears interest which it is for the benefit of the infants to stop; (2) the case of a widow's jointure, provided she has not married again. In these two cases the court should appoint a guardian for the infant heirs, who will guard their interests; and if there is no defense, the descended estate will be sold, and the debt paid off (see also B. B. 5b, 22a, 174a). Whether the heirs be under or over age, the creditor can not proceed against them without taking the oath, unless there be a clause in his bond in which the debtor declares faith in his truthfulness. Should the creditor die, and his heirs set up a claim against that of the debtor, they must take a solemn oath framed for the circumstances (see Sheb. 45a), unless a clause in the bond avows faith in the creditor and in his heirs. Where the creditor does not know of assets descended, and calls upon the debtor's heirs for payment, and they, while admitting the debt, deny the receipt of assets, they may clear themselves by the rabbinical oath. A fine, such as was often imposed by the rabbinical courts ("ḳenas"), falls to the ground with the wrong-doer's death, and can not be collected from his heirs (Ḥoshen Mishpaṭ, 108, 2). The rule of enforcing all demands against the obligor's heirs is of late date. Rab and Samuel, the first of the Babylonian "pairs" (c. 230-250), still agreed in the proposition: "He who lends by word of mouth can not collect either from heirs or from purchasers" (B. B. 175a; but see Robbery as to liability of descended lands for things taken forcibly). 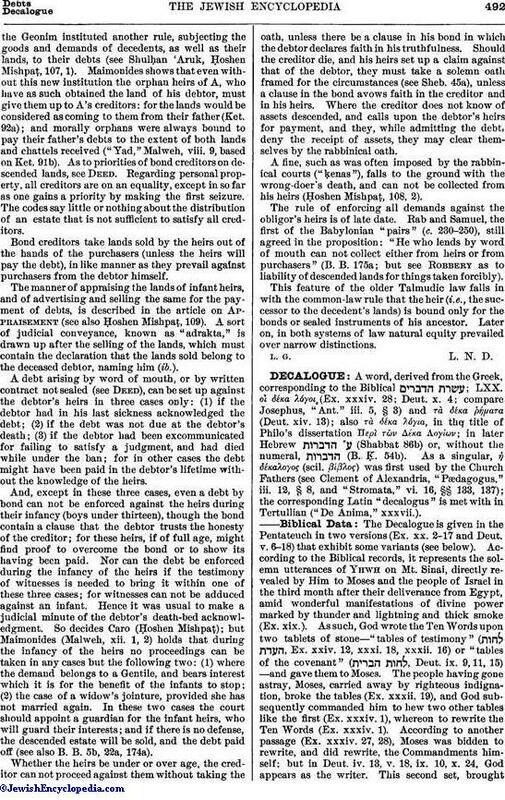 This feature of the older Talmudic law falls in with the common-law rule that the heir (i.e., the successor to the decedent's lands) is bound only for the bonds or sealed instruments of his ancestor. Later on, in both systems of law natural equity prevailed over narrow distinctions.